Happy Kitchen Sink Stamps Monday! Thanks for stopping by, I hope you had a great weekend. 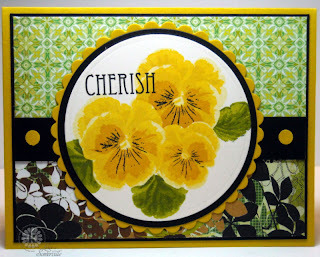 I've been going through my Kitchen Sink Stamps to see what sets I haven't created a "how to" video for, and decided to share this card using the 3 Step Pansy. I pulled my colors from the beautiful Basic Grey Origins paper. Every once in awhile I receive emails in regards to stamping Kitchen Sink Stamps images, and thought I'd post some questions and responses here on my blog. Why do you stamp off? Stamping off is great when you don't have a lot of inks in the same color family. By stamping off you can get a lighter shade of ink. What order do you stamp your images? Most of the time I stamp my images out of order, for example, if it's a 4 step image, I stamp 3, 2, 1, then 4. Image 4 adds a lot of detail to your stamped image, and is done in the darkest ink, I use that one last, so the detail doesn't get muted by the other stamped images. It's a lot easier to stamp out of order to be able to line up the other images. Image 1 is always your lightest color ink, and depending on what shade you are using, you might not always see it on your card stock. When I'm stamping leaves, I usually stamp 1, 2, then 3. The reason I do this is because I want to be sure the stem of the leaf is in the right place and not floating off in space. Be sure to stop back later this week, as I'll be sharing some sneak peeks of next weeks Kitchen Sink Stamps Release. Beautiful, and wow! The art, the papers...the video, all just perfect! I LOVE yellow pansies, Lisa!! They look wonderful with the way you stamped and designed. Beautiful colors and papers, too! Absolutely Adorable! Such a bright & cheery card! Stunning work, Lisa! Love the colors you chose! TFS! Love your exquisite yellow pansies, Lisa!! They look stunning on this fabulous layout!! Thanks for including the multi step theory and instructional video!! Great job! Oh Lisa! Your yellow flowers are just so bright and cheery! Love this mix of DP with them too!!! Love the flowers, the papers are perfect with it the image, they are so pretty! gorgeous card! I love the BG origins paper! These are just fabulous! So lifelike and such rich colors - I'd love to have these in a vase! I love this card. Everything works together, it's a good balance of pattern paper & stamped image. I'm glad you posted this on splitcoast, I've never seen the kitchen sink stamps. WOW those are some gorgeous flowers and you make them so beautifully!